Chic and sporty, the new White Diamonds makes a stunning addition to the long-established Multifort collection, first launched by watchmaker Mido in 1934. Graced with 11 real diamonds, its dial in white mother-of-pearl set into a satinated disc is the height of bold femininity. 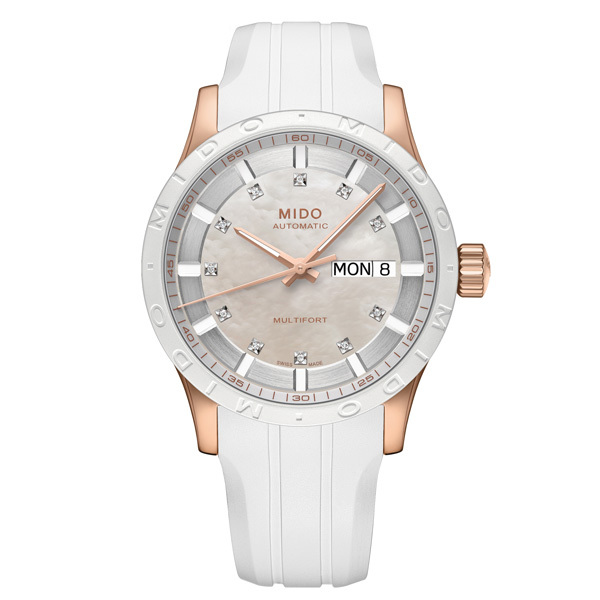 The white rubber bezel encircling the dial bears the Mido imprint. The strap, also in white rubber, and the rose PVD-treated steel case bring a resolutely contemporary touch to this model, making it one of summer’s must-haves. Launched in 1934, just two years after the completion of the Sydney Harbour Bridge, the Multifort collection shares some remarkable characteristics with the famous structure: a perfect balance between function and aesthetics. A fundamental truth that time has not altered, since Mido this year celebrates 80 years of uninterrupted production of the Multifort – one of the longest periods of production in the history of Swiss watchmaking. The Multifort White Diamonds features an elegant dial of white mother-of-pearl encircled by a satinated disc. The 11 diamonds (total 0.0506 carat) set into it add exceptional sparkle to its superlative elegance. 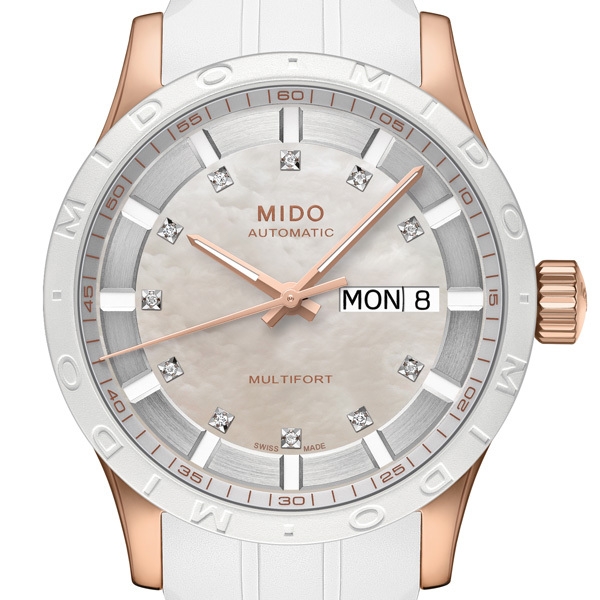 Its 38 mm rose PVD-treated steel case is encircled by a white rubber bezel bearing the Mido imprint. The strap, also in white rubber, and the rose PVD-treated steel case bring a resolutely contemporary touch to this model. Featuring an elaborate automatic movement, the Multifort White Diamonds is water-resistant up to a pressure of 10 bar (100 m/330 ft). Its dial is protected by anti-reflective sapphire crystal treated on both sides. The hour and minute hands and the indexes are treated with white Super-LumiNova® to give perfect readability, even at night. A window positioned at 3 o'clock displays the day and date. The transparent case back enables the admiration of its elaborate movement finely decorated with blued screws and oscillating weight adorned with Geneva Stripes and engraved Mido logo. All dressed in white, the Multifort White Diamonds is a timepiece designed for dynamic women who appreciate fine watchmaking. With its sophisticated, sporty look, this model is definitely set to become one of summer's must-haves. Automatic ETA 2836-2, 11½’’’, Ø25.60 mm, height: 5.05 mm, 25 jewels, 28,800 A/H, NIVACHOC and NIVACOURBE shock-absorber, NIVAFLEX NO mainspring, NIVAROX II balance-spring. Finely decorated elaborate movement with blued screws, decorated oscillating weight with Geneva stripes and engraved Mido logo. Function HMSD+Day. Adjusted on 3 different positions for a high accuracy. Min. 38 hours power reserve. Stainless steel 316L with rose PVD treatment, Ø38 mm, white rubber bezel with engraved Mido, 3 pieces, sapphire crystal with an anti-reflecting treatment on both sides, screwed crown and case back, transparent case back to see the finely decorated and elaborate movement, engraved serial number, water‑resistant up to a pressure of 10 bar (100 m / 330 ft). White rubber strap and stainless steel pin buckle with rose PVD treatment. White mother-of-pearl, 11 genuine diamonds (total 0.0506 carat), satinated disc, indexes with white Super‑LumiNova®, day and date at 3 o’clock. Hour and minute hands with white Super-LumiNova® for easy readability at night.